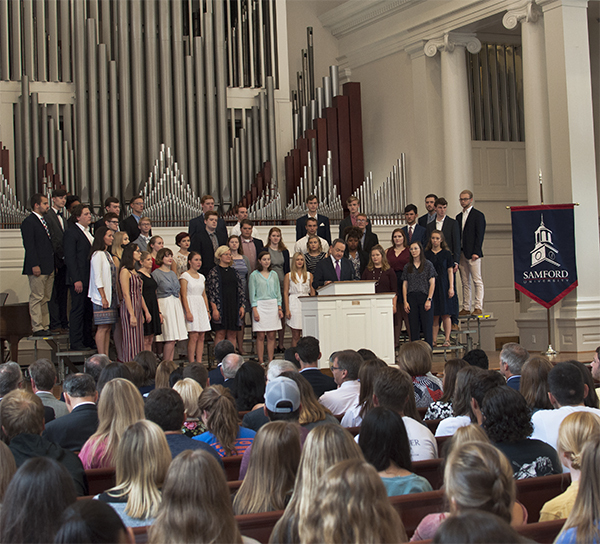 Samford University rededicated four campus facilities in a special worship service Aug. 30. The service, in the renovated A. Hamilton Reid Chapel, brought together faculty, students, administrators, trustees, local officials and representatives of the companies that completed the $13.8 million renovation projects. In addition to Reid Chapel, the rededication included Robert I. Ingalls Hall, Percy Pratt Burns Hall and James Horton Chapman Hall. Burns Hall and Chapman Hall are the new homes for the Office of Spiritual Life and the academic departments of religion, history, philosophy and classics. Ingalls Hall is now home to the academic departments of political science, geography and sociology, English and psychology. The renovation of Ingalls Hall will continue through the fall semester to create space for expanded offices for Admission and Student Financial Services. “Welcome to your new home,” said Samford Board of Trustees chairman Tim Vines as he opened the service. When Samford president Andrew Westmoreland spoke, he celebrated not only the rededication of the facilities, but also the leadership and supporters of the $300 million Forever Samford campaign, which is now halfway to its goal. "These generous investments enable us to make progress such as we celebrate today," Westmoreland said. Other speakers at the service included SGA Chaplain Lucy Kate Green and Howard College of Arts and Sciences dean Tim Hall, who offered thanks on behalf of the college’s faculty to all involved in the renovations. Hall and Green led a prayer of dedication that echoed Robinson’s call for personal rededication. Music for the service was conducted by Eric Mathis, associate dean of the School of the Arts, and included University Organist Frederick T. Teardo and the Samford University A Cappella Choir under the direction of Philip L. Copeland, professor and director of choral activities. Homewood Chamber of Commerce sponsored the official ribbon cutting. Watch the full rededication ceremony.